It’s that time again to cut through the clutter of marketing messages and explore some real-world implementations for the Internet of Things! As part of our continued effort to track the IoT ecosystem, we once again set out (mining thousands of homepages) to assemble, verify, and classify 1,600 actual enterprise IoT projects in a structured easy-to-use database. Most of the IoT projects we identified are in Smart City (367 projects), followed by industrial settings (265) and Connected Building IoT projects (193). The Americas make up most of those projects (45%), followed by Europe (35%), and Asia (16%). There are large differences when looking at individual IoT segments and regions. The majority of Smart City projects are located in Europe (45%), while the Americas, particularly North America, are strong in Connected Health (55%) and Connected Car (54%). The Asia / Pacific region is particularly strong in the area of Smart Agriculture projects (31%). In comparison to our 2016 ranking, Smart City (driven by government and municipality-led initiatives) has surpassed Connected Industry as the number one IoT segment of identified projects while Connected Building (driven by widespread uptake of building automation solutions that increase operational efficiency and reduce costs) has climbed four places to become the third biggest IoT segment. 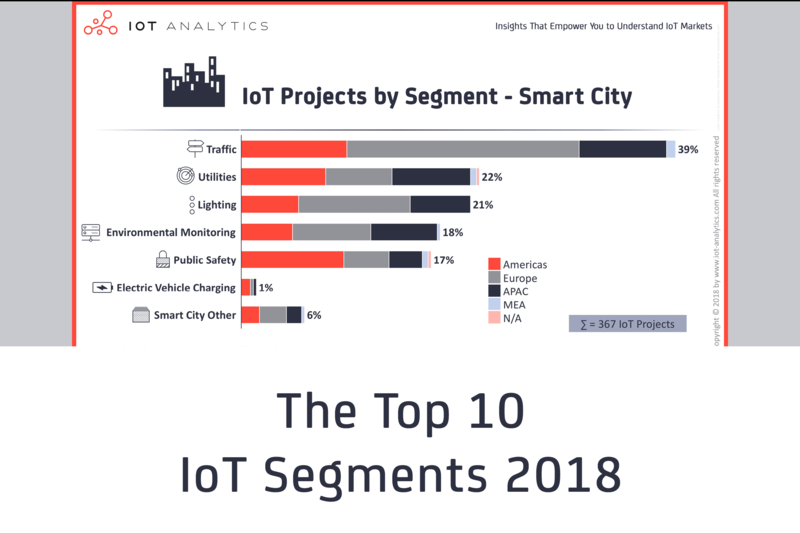 Smart City is now the largest IoT segment in terms of number of IoT projects identified (23%), taking over the 2016 number one IoT application area from Connected Industry. The growth has been driven by hundreds of recent Smart City initiatives started by governments and municipalities around the world. Prominent examples include Singapore and the City of Barcelona. The most popular Smart City application is Smart Traffic including projects such as parking systems, traffic monitoring&control, bike sharing, smart bus lanes, but also more exotic applications such as smart ferry systems or smart bus shelters. Other Smart City initiatives evolve around utilities, lighting, environmental monitoring and public safety. Europe accounts for the greatest number of Smart City projects identified (164). 17% of all identified IoT projects are Connected industry related. This segment covers a wide range of connected “things” both inside and outside the factory. The most popular Connected industry applications were equipment monitoring in non-factory environments. Typical non-factory projects include asset monitoring and remote control of connected machinery such as cranes, forklifts, drills, or even entire mines and oil fields (e.g., Cisco’s connected mining operations for Rio Tinto in Western Australia). “Smart Factory” automation and control projects were the second most popular application in Connected Industry including holistic solutions with numerous elements such as production floor monitoring, wearables on the shop-floor, remote PLC control, or automated quality control systems (e.g., Varroc, an automotive component manufacturer, is using digital factory solutions from Altizon to connect industrial machines in the manufacturing environment). The Americas lead the way for Connected Industry projects (45%). 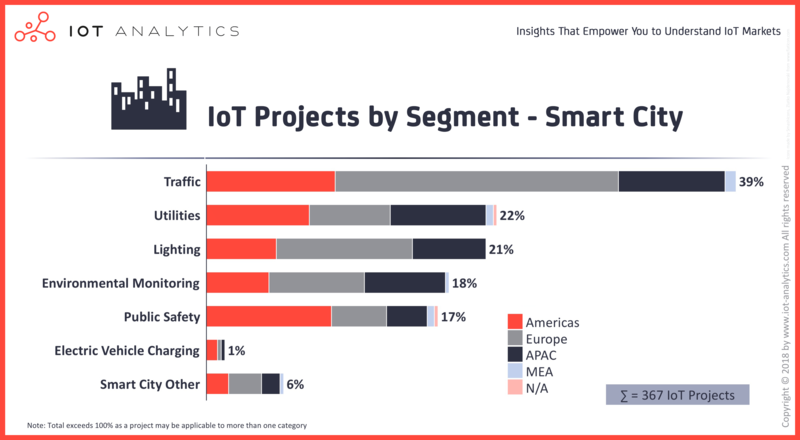 Of all segments, connected building has experienced the largest increase of IoT projects compared to the 2016 study (7 percentage point increase). 61% of Connected Building projects identified involved facility-automation to reduce energy costs (e.g., the Marriott hotel chain in China is implementing building automation solutions resulting in savings of 10-15% on energy costs). 39% of projects are related to building security and 31% to HVAC/Heating/Cooling. The number of Connected Car projects identified has more than doubled since the 2016 IoT projects list, with most focusing on vehicle diagnostics (77%) and fleet management solutions (57%). For example, TracknStop, a remote-control software company in Ireland is enabling vehicle diagnostic solutions including real-time tracking, monitoring of sensor readings, and remote control of vehicles. Low-power (LPWAN) connectivity technology coming up quickly. 7% of all identified IoT projects make use of the new and upcoming LPWA connectivity technology. An overwhelming 64% of those projects identified focus on Smart City, with others focusing on Smart Agriculture and Smart Energy. LoRa technology accounts for 37% of those projects followed by SigFox (21%) and NB-IoT (19%). Most enterprise IoT projects focus on cost-reduction. The main value driver for most IoT enterprise projects is cost savings (54%). Only 35% of IoT projects are used to increase revenue (e.g., by offering new IoT-connected products and services). 24% of projects also increase overall safety (e.g., by offering enhanced monitoring systems with real-time alerts and notifications). 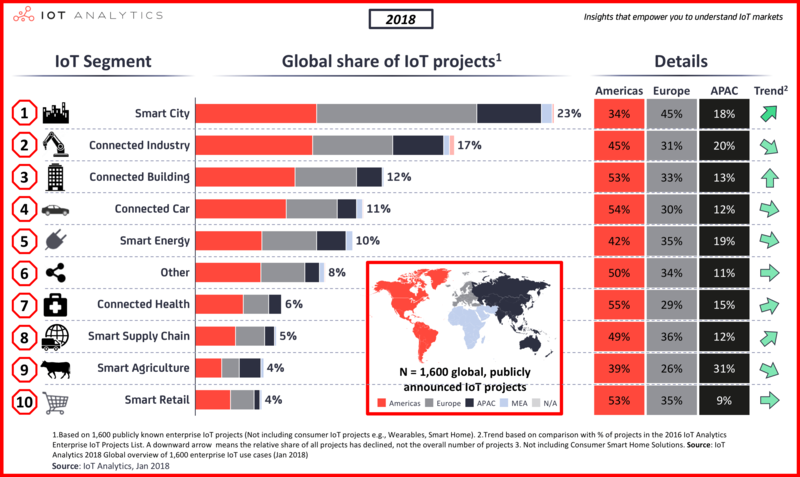 While the list of 1,600 IoT Projects is certainly not complete, our analysis leads us to conclude that the total number of globally announced and published IoT projects is still limited. Triangulating the list with a number of other data points, we believe the total number of IoT enterprise projects (including all unannounced projects) is in the range 10,000 – 30,000 projects. This range is well in line with our overall market model and our observation that the market has not yet exploded but is growing steadily at 30-40% on the back of many pilot projects and small roll-outs – with some verticals seeing above average growth such as Smart City. This steady growth is forecast to continue for the remainder of 2018. On the other side of the world in North America, tornado monitoring solutions are saving lives with predictive alerts for residents in the danger zones. As climate change is currently a hot topic we are big fans of the “Smogmobile” in London which contains sensors that can measure greenhouse gases such as CO2, methane as well as Ozone, nitrogen dioxide and small particulate pollutants that are known to have a detrimental impact on health. And finally, NASA are using connected Robonauts for air quality testing in space. During a period of 3 months, our team spent hundreds of hours researching enterprise IoT projects and verifying them. In a first step, we mined the websites of all major IoT vendors in regard to publicly documented IoT use cases. The vendors were mainly identified from the List of 450+ IoT Platforms and the previous 2016 IoT projects list, as well as from expert interviews and additional desktop research for new players developing solutions for the Internet of Things. Furthermore, we carried out a comprehensive and systematic key word search in order to eliminate potential biases and add to the existing repository from 2016. Scope: We focused on enterprise IoT solutions that are either directly employed by enterprises or sold to enterprises, thus excluding consumer-only cases such as wearables or home automation. If you want to find out more about our research or the List of 1,600 Enterprise IoT Projects feel free to reach out! You can download a sample of the project list (in EXCEL) as well as a sample of the metadata analysis (in PDF) . We believe the list is a highly valuable reference point for anyone working in IoT and we are planning to update the list and analysis in 2019. Please note: A project is only included in the list if sufficient information is publicly available, on the source link provided, to explain what type of project it is, who the end-user involved is, who the IoT solution provider involved is and additional benefits of implementing the IoT solution. For example, if a solution provider states they have the capability to offer a specific enterprise IoT solution but do not mention an end-user or more details on a real deployment, then this is NOT included in the list. It is our understanding that many more projects exist however this list represents the best sample we could ascertain following months of intense research. Padraig Scully leads the market research team at IoT Analytics. He has extensive experience in Telco and technology research having worked at Ericsson and the Wirelss Access Research Centre at the University of Limerick. Current focus areas include IoT Platforms, IoT Security, LPWAN, and M2M. The global Internet of Things (IoT) market is projected to grow from $2.99T in 2014 to $8.9T in 2020, attaining a 19.92% Compound Annual Growth Rate (CAGR). Thank you for article. Smart Energy is the 5th place in IoT Segments on your 1st picture. There https://www.kaaproject.org/smart-energy/ I read about smart energy solutions and smart lighting. I think that smart energy is the part of smart cities. Here is another article about city streetlights on your website. IoT for smart energy can be used not only for business, but for own houses. Interesting, how much it costs for smart house or home?